There is a blog entry with the following details on but in order to keep it fairly visible I thought it would be a good idea to replicate that post as a page in the blog. If you want to read the blog from the beginning you should start here. I completed the challenge again in 2018, scroll down to read a copy of my blog post regarding that challenge. 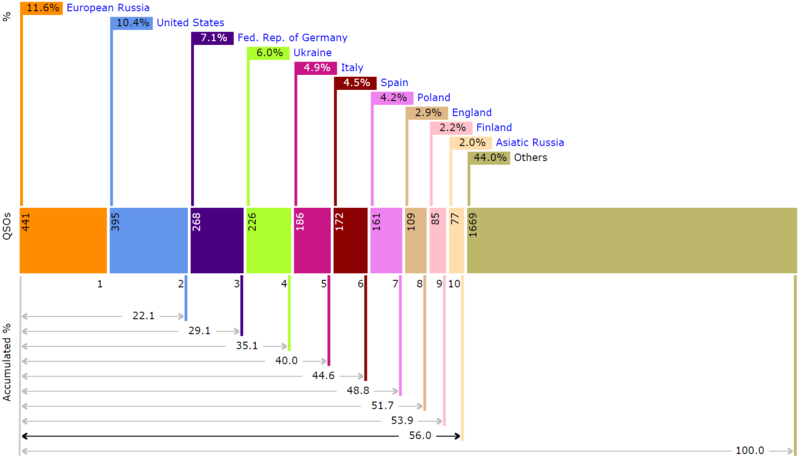 To start with I’ll post the basic statistics for the entire year of 2011. It should be noted that these figures only include contacts made using G6NHU so any QSOs had by GR6NHU aren’t included. Days missed: 0 <– This is the most important statistic, it means that QSO365 was a success. The year started off quite slowly and picked up when the bands began to open as we came out of the winter months. The figures above aren’t representative of April and May because I was using my special Royal Wedding callsign GR6NHU for some time during them. My logbook has now been completely uploaded to this site for people to search (courtesy of Pete, 2E0SQL), you can access it by clicking here. All QSOs have also been uploaded to LoTW, eQSL and ClubLog. One of the highlights for me was working some of the DXPeditions over the year, specifically T32C, TU2T and ST0R. I’ve missed others but it was very good to get those three in my logbook this year. I’ve also enjoyed writing the blog on a regular basis. Things were difficult when I suffered from a near lightning strike but I managed to get through that, luckily I’d already had a QSO on the morning of the strike before going to work. I’ve been asked if I’m going to repeat the project with a ‘QSO366’ in 2012 (it’s a leap year, hence the 366) but it’s not something I’m keen to continue. I’ve enjoyed it and I’ve learned a lot but in some ways it’s been quite a tie. I’ve had to rush home from events in order to make the daily QSO and it’s not always been the most convenient thing to do. Plus I also want to completely strip and rebuild the shack and that’s not something it’s possible to do when one has to make a QSO every day. It will be difficult to get out of the habit though, on the 1st January I automatically switched the radio on and had three QSOs, to Finland, Cameroon and Belarus! Looking ahead I want to continue working new DXCC entities and increasing my totals. I guess my long term goal is for a full five band DXCC but that’s still some way in the future. In the meantime my closest goal is to get the Worked All States (WAS) award and I’m only a few States away from doing that. I need to improve my aerial system for the lower bands. At the moment the lowest band I can comfortably work is 40m so I really need to get something for 80m. A simple long wire really isn’t enough for me and I’m looking to see if I can make a full size horizontal loop fit in my garden. I’ll continue to update the blog but it certainly won’t contain the sort of detail as last year. I’ll post about new countries worked and other milestones but don’t expect anywhere near as many entries as before. The QSO365 Twitter account will automatically post about updates so you can spot them that way or subscribe to the blog using the button over on the right at the bottom. 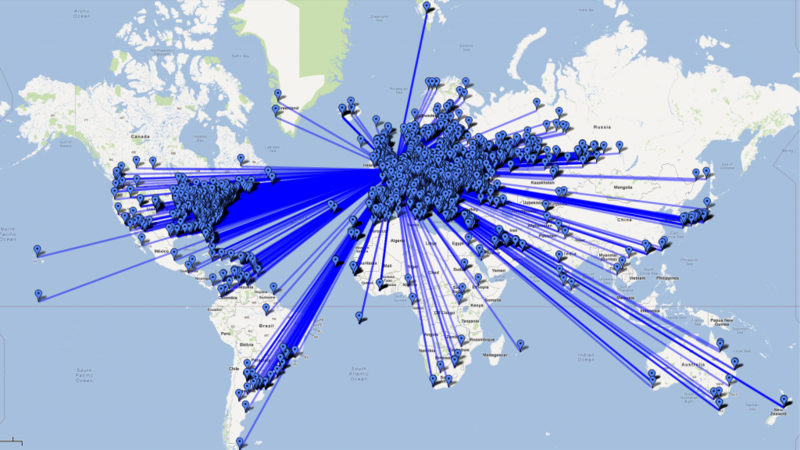 I’ve run my logbook through qrz.com and produced a map of all the stations I’ve worked this year who have their location details available. Out of the 4138 QSOs, I’ve been able to map 3333 of them. Click the image for a full size version. I’m often asked how I produce the maps I post here. My logging software (Aether) allows me to export a file in .kml format which is for Google Earth. It’s possible to load that file into Google Maps and that’s what I do. I then screenshot the image from Google Maps.